[As Griffin describes below, he was joined by 2 Melrose teammates this summer in the GTD xc program. Marblehead sent 9 runners to the program. At the Divisional meet on November 14, these were the top 2 teams in Division 4. At All States on November 21, they were the top 2 teams in Division 2. GTD: Griffin, this was your 2nd summer training in Coach Braz's program. What do you look for in the program each summer? Griffin: Every summer I look for a program that will give me the opportunity to be trained under a different coach's philosophy and style, as well as getting quality workouts in with runners outside of my team to push me. I found all of this and more at the GTD training sessions this summer. The program gave me lots of guidance on how to train and race properly as well as exposing me to workouts and training elements that we normally do not do on my team in the regular season. Griffin: One of my favorite drills we did over the summer was the timed pick-up runs around the field complex. The Melrose team often runs interval workouts and speed drills, but we never did it GTD style, where we would run at a normal pace for a set amount of time and then pick it up to close to our race pace for a different period of time. This got me used to kicking in speed while in the middle of a race and helped me control my pace and surges much better during the season. The "Jesus Hill" hill repeats were probably the most beneficial, yet most agonizing, drill we did at GTD. It consisted of running up a very steep hill about 100-150m long, then continuing across the top at the same pace before going back down, doing core drills at the bottom, and then repeating up the hill again. This workout really taught me how to push through pain in races and improve my hill running abilities, but my legs get sore just thinking about it. GTD: The last phase of each training session this past summer was devoted to core work, flexibility, and strength. Tell us about it. Griffin: The flexibility and core session of GTD was extremely beneficial to my performance this year. I became a much stronger and more flexible runner than I had ever been in the past, especially because of the Hurdle Mobility drills we often did before core (a personal favorite of mine). The core sessions were more intense than anything we ever did on our team, pushing our bodies and minds to the limit and leaving us as stronger mental and physical runners. Griffin: Before I race, I always make sure to drink lots of water in the 4 hours leading up to the race to avoid cramps and dry mouth at all costs. I also do our team's routine dynamic stretches right at the line before taking my sweats off, as well as quadruple knotting my spikes, mostly for mental reassurance that they won't come undone. It has also become a team tradition that we sport white headbands in the race, so I make sure to secure it to a comfortable tightness around my head before heading over to the line. GTD: You were joined by two of your Melrose teammates this summer, and your team had a great fall xc season. Tell us about it. Griffin: This summer I was joined by our 4th runner on the team, Sean Conlan, and our number 1 runner, Kevin Wheelock at the GTD sessions. We all had lots of fun and really benefited from training with our late-season competition and focusing on our speed and hill running abilities throughout the summer. We ended securing our second consecutive undefeated Middlesex Freedom League Title, as well as finishing 1st at the Big Wave Invitational, 3rd at the Catholic Memorial Invitational (#1 MA team at the meet, lost to 2 New Hampshire teams), 2nd at the MIAA D4 meet, and surprising many by finishing 2nd at the Division 2 All-State Championships. Both Sean, Kevin, and I improved our times tremendously and overall had great seasons. We all surprised ourselves at the end of the season and managed to pull off an unforgettable ending to our season. GTD: What were some of the highlights of your own xc season? 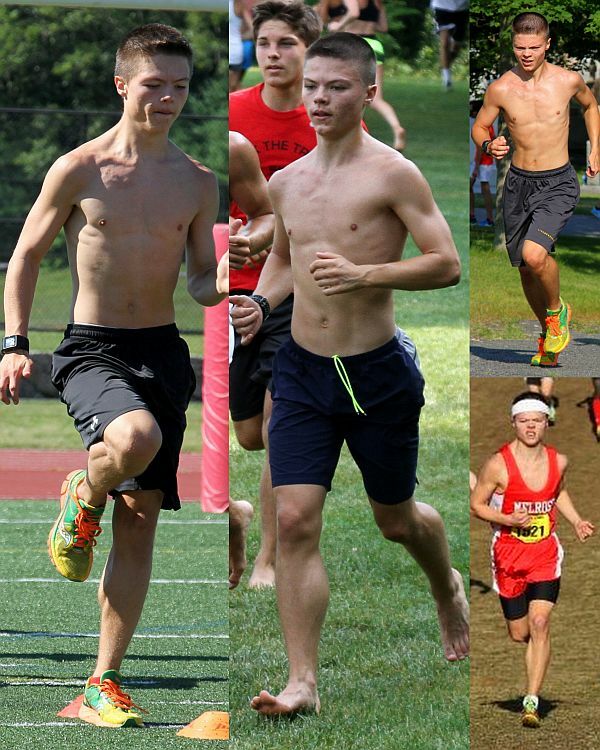 Griffin: My season went exponentially well compared to last year's cross country season. I maintained a spot as the 5th man on our team and managed to improve my 5K PR by 1:07 from the previous year. I managed to mentally improve my race and become a more experienced, faster runner because of it. GTD: What are your winter/spring plans for running? Griffin: This winter I hope improve my 600m PR by 4 seconds and place in the top 5 at our league championships. Unfortunately, I will not be able to attend our state meet due to an exchange trip to France, but I hope to make the most out of my shortened season. I also hope to send a Distance Medley Relay team to the New Balance Nationals Indoor meet and place well at the State Relay Meet. In the outdoor season, I hope to improve my 400m PR to under 51 seconds and qualify for the D3 championship meet, as well as sending a Distance Medley Relay team to the New Balance Nationals Outdoor meet.